Heading to the one of our NJ Laundromat locations? We’ve provided a list of 7 tips that will help your trip be as clean, quick, and wrinkle-free as possible. If you asked a thousand people to write down their favorite weekly activities, would anyone include “going to the laundromat” on that list? Probably not. So it’s not surprising that people can get a little touchy when slogging through their weekly ritual. Let’s all make our next trip to the laundromat a little more pleasant by following these 7 simple etiquette tips. Don’t leave your clothes unattended. But if you do decide to run a few errands, make sure you’re back in time to remove your clothes before the cycle ends. Other people may be waiting to use your machine. Wait 15 minutes before removing someone else’s load. If somebody failed to follow the first rule and you need to use their machine, wait about 15 minutes after the cycle ends to remove their clothes and place them neatly above the machine. 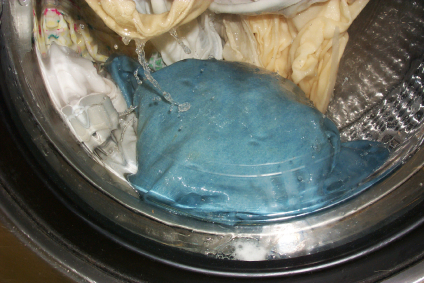 Use only the recommended amount of detergent and bleach in the machine. Most washing machines have a label with directions under the lid. By following these recommendations you’ll get a better clean without overloading the machine or leaving any excess bleach behind. The next person to use the machine will appreciate it. Wait until the wash cycle is over before claiming a dryer. When the laundromat is full, everybody needs to wait their turn. Reserving a dryer when your clothes are still in the washer confuses the queue. Clean out the lint trap. Most dryers at laundromats do not have lint traps that are accessible to the public. But if your laundromat does, make sure to clean the lint screen when you’re finished with the machine. Leave the door or lid open when you’re done. Once you’ve removed a load from a washer or dryer and you’re done with the machine, leave the lid or door open. This is the universal sign that the machine is available. Keep your children under control. A laundromat is a boring place for a kid, and a bored kid can get a little crazy. Make sure you bring something to keep them entertained. At NJ Laundromats, we also have flatscreen TVs and free WiFi at all of our locations.